Simon Potter, the Unsung Hero award winner in the Peterborough Telegraph Sports Awards, is pictured after receiving his prize yesterday. With him from the left are Ian Hamilton (secretary), Alan Graham (chairman), Andrew Burgess (president), Archie Bennett (vice-chairman), Margery Beuttell (treasurer), Hugh Burnham (club captain) and Tina Prewer (age grade chair). 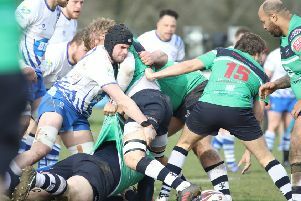 Peterborough Rugby Club’s junior teams had mixed fortunes against Boston yesterday (March 17) morning. The Under 14s celebrated a 41-14 victory but the Under 16s were beaten 24-35. Harvey Tomeo scored a try on his debut as the Under 14s made it four wins from six games. George Neale crossed the line twice and kicked both a penalty and conversion while there were single tries for Mackenzie East, Arjun Singh and Rowan Forbes. Harry Missin added two conversions and George Dangerfield the other. For the Under 16s, George Dean helped himself to a brace of tries while Reagan Beacher and Matt Waitman had one apiece, with Ollie Cooke kicking two conversions. 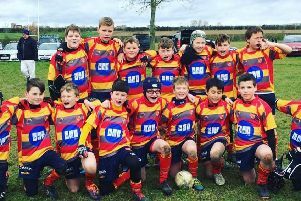 The Under 15s failed in their bid to become the first junior boys’ team from the club to reach an East Midlands Cup final in three years as they crashed out at the semi-final stage, going down 44-0 to a big, strong Bugbrooke team. Visiting Old Albanians put a spanner in the works as the club’s Under 15 girls team staged their ‘Big Event’ tournament in the afternoon, taking the trophy home to St Albans after a string of surprise wins. They became only the second team to beat the Borough girls all season, and then won the final against Barker’s Butts, the team that knocked Borough out of the National Cup. It was also only Butts’ second defeat of the season, having lost to Borough in October. The high-quality tournament featured four of the last 12 sides in the National Cup with the host club at least having the satisfaction of beating Welwyn, who are one of the last six teams left in that nationwide competition, as well as Bedford. Before yesterday’s girls matches Simon Potter was belatedly presented with his Peterborough Telegraph Sports Awards prize by club president Andrew Burgess. Simon won the Unsung Hero award but was unable to attend the presentation dinner due to work commitments. Simon has spent the last five years actively developing girls rugby down at Peterborough Rugby Club and he’s done a fantastic job. Two seasons ago his Under 13 girls team went through the whole season unbeaten. Twice they set club record scores in excess of the 100-points mark and they were crowned East Midlands and Eastern Counties champions. This season as Under 15s, they are set for similar success and it’s fair to say Borough’s girls rugby set-up is the envy of many, thanks in the main to Simon. No less than 12 girls from the club were recently honoured with East Midlands representative recognition. Away from the pitch, Simon works tirelessly as the club’s mini and junior fixture secretary.